This year on Game of Thrones, the dragons are bigger and nastier — so the VFX crew bringing them to life had to come up with two new methods for portraying Drogon, the biggest of the bunch. Including "the world's largest fire-breathing crane." Drogon is twice the size he was last year. He's about 40 feet long and 20 percent bigger than the other two dragons. He's also the alpha, so his way goes. He's still affectionate with Dany, but he's got his own mind and needs her less, just like any child growing up... Drogon gets to perform more this year than ever, and have more complex interactions with Dany. 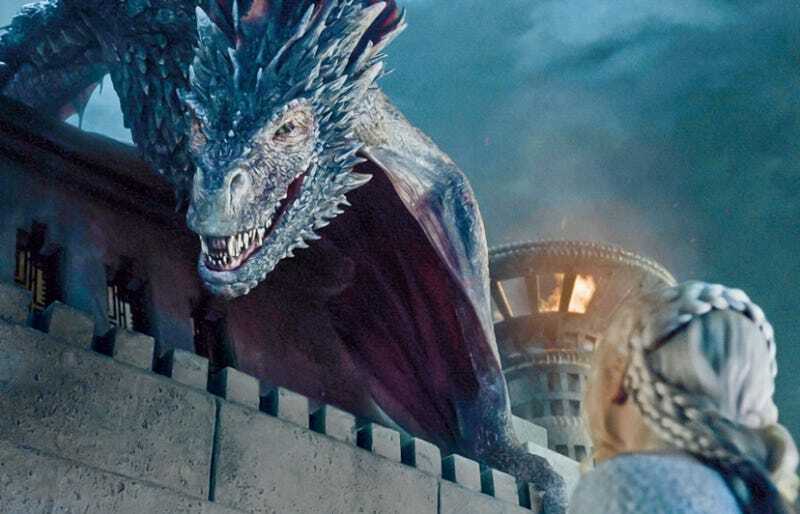 To create Drogon's movements, they started with a "Technodolly," which is a 15-foot crane usually used to hold a camera on its telescopic arm — but instead, they put a flamethrower on the end of it. "Standing 50 feet away from the dragon fire, you could get a nice tan," said producer D.B. Weiss to TV Insider. Over that, they sketched the fine details of Drogon's movements digitally — and this year, he's based on Komodo dragons, iguanas, horned lizards, and crocodiles. His movements are based on eagles and bats, and the way he takes off is based on pelicans. Meanwhile, the VFX team also used a Simulcam system, so you can see by looking at the monitor where Drogon would be in the final shot, and "the scene could be framed properly," says VFX producer Steve Kullback. This is all a huge upgrade from previous years — in season one, dragon balls were tennis balls on sticks. In season two, they were stuffed dragons, or maquettes, on her shoulders. Then they were soccer balls on 30-foot poles.